Harvesting Clovers in Gold Fields! Did you see what Camila managed to harvest? For a limited time only, Super Miracle Cubes can be purchased from the Cash Shop! It seems that the Utah Farm's Lucky Harvest is not over! This time, Aunt Anna found some clovers sitting around, seemingly due to St. Patrick's Day round the corner! 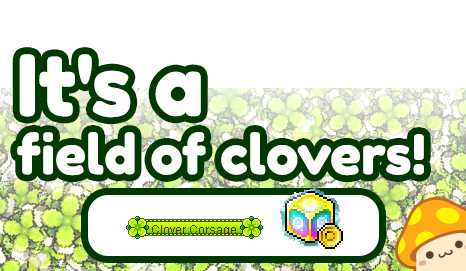 With the help of the Moon Bunny's Jewel Crafting Magic Mortar, a limited stock of Clover Corsage medals is now available! Everyone that purchased at least ONE Super Miracle Cube will be entered into a raffle. Purchase of the Super Miracle Cube 11x bundled version will also be eligible. Purchases made with Maple Points and/or Mileage will not be included. 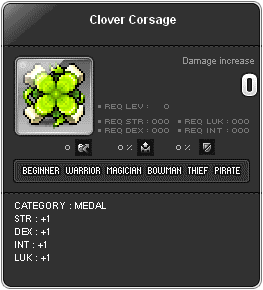 Up to 100 lucky players in each World will receive the Clover Corsage medal freshly harvested from Utah's Bean Chicken Clover Farm. Lucky Winners will be credited with the reward in a future Server Check. All participating Maple IDs will be entitled to one chance, regardless of purchase quantity. • Only purchases made entirely in Maple Cash is eligible for this promotion. Purchases made with Maple Points will not be accounted for. • Gifted purchases will allow the gifter to be eligible. • Players who have made successful purchases and are eligible for rewards will receive them via the Reward Box System in-game, to be credited during future server maintenances. • Players must ensure that their email addresses stated on their MapleSEA Passport account is active and accurate. Playpark Pte Ltd and Nexon Korea Corporation will not be held responsible in cases of lost email, or cases whereby the participants cannot be contacted via their registered email addressed tied to their MapleSEA Passport account. • Playpark Pte Ltd and Nexon Korea Corporation reserves the rights to make any changes to the above mentioned without any prior notice. • Playpark Pte Ltd and Nexon Korea Corporation reserve the right to disqualify and take action against any player that violates our abuse policy.